Smallmouth bass. If you enjoy the acrobatic, tail-walking dances and sheer power of a tough adversary, you'll love fishing for smallmouth bass. This is a popular game fish pursued by anglers throughout the country. Its natural habitat is in northern, cold waters yet has been stocked and is thriving in a variety of lakes and streams. 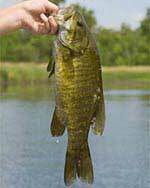 Smallmouth bass, aka smallie, bronzeback, brown bass and brownie, feed primarily on, crustaceans, insects, crayfish, smaller fish and baitfish. Ideally smallmouth prefer cooler water than does the largemouth, and are quite comfortable in current. Preferring water temperatures of 60 degrees or above, the smallies migrate to deep water and basically hibernate during the coldest seasons of winter. During these times they are difficult to catch. Small baits, worked very slowly are often the only way to provoke a strike. In warm water they can feed quite aggressively and will readily take crankbaits, spinnerbaits, topwater lures, jigs, worms and most baits that resemble baitfish or crawfish. While the smallmouth only grows to about half the size of the largemouth, it is much more agile, faster and more powerful for its size. It eats pretty much the same foods, often concentrating on smaller specimens. It is without argument one of the finest game fish an angler can pursue. The thrill of the frantic runs and jumps are the source of many a fisherman's dreams. Top Baits: Spinnerbaits, crankbaits, jigs and plastic worms. Fish shallow to moderate depths as the smallmouth move into the shallows for warmer water, spawning and food source activity. Gravel points and submerged humps are prime holding areas. Top Baits: Crankbaits, jigs, top water and plastic worms. Fish shallow in the mornings and evenings and move deeper as the sun rises. Use lures that mimic crawfish or shad as these are favorite foods for smallmouth. Follow points and rocky or gravel structure deeper until you establish the proper depth. Reefs with deep water nearby are prime targets. Smallmouth often feed at night during the hot summer months. Top Baits: Spinnerbaits, crankbaits and spoons. Fish shallow to moderate depths in the mornings and then again late in the afternoon after the sun has been on the water and warmed the shallows. As the bass move deeper concentrate on deep structure and use jigs, worms and spoons. Top Baits: Jigs, pork baits and plastic worms. No reason to be on the water at the break of day. If anything, later in the day may be the most active for fishing shallow as these areas warm from the sun. Smallmouth are less active in cold water, so move your bait in a slow, easy to catch manner. Fish shallow feeding areas first. But if they are not shallow concentrate on deeper structure. "Deep" depends on the overall depth of the lake you are fishing. In some lakes you may need to go as deep as 60 feet while others seldom hold fish below 45 feet. Smallmouth also suspend in open water just outside the structure they use. Smallies can be found in a variety of temperature-range fisheries, from northern lakes that freeze over in winter, to lakes in the southwestern deserts that may attain surface temperatures in the nineties during summer. In some older lakes where largemouth fishing has deteriorated, smallmouth have been introduced with some success. In some of these cases the smallmouth have flourished - particularly in waters where stripers have depleted the largemouth population. Find smallmouth fishing by state. During the spawning season look for smallmouth to nest deeper than largemouths. Water clarity dictates the depth as they choose areas where sunlight will penetrate to warm the eggs. Female smallies can lay more than twenty thousand eggs. After dropping the eggs, the female moves to deeper water to recover while the male guards the nest. Find smallmouth bass in local waters. Use the state list on this page to identify lakes in your area which have populations of bass.